UPDATE (8/29/2012): According to DirecTV’s Twitter feed, NFL Sunday Ticket for PS3 will be available beginning on 9/4/2012. UPDATE (9/1/2012): We’ve got our answer. NFL Sunday Ticket will be returning to PS3 beginning on September 4th. Since NFL Sunday Ticket’s arrival in the mid-1990’s, DirecTV had been the only way you could get Sunday Ticket. So for displaced fans who couldn’t otherwise watch their team at home an couldn’t get (or didn’t want) DirecTV, even the rather steep price of $340 for 17 Sundays of NFL football was worth it. 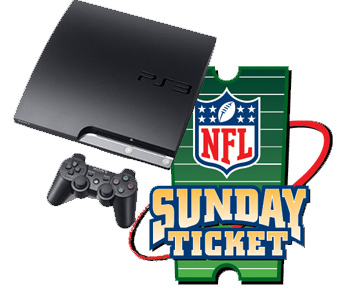 The initial reviews of NFL Sunday Ticket on PS3 in 2011 were lousy, but Sony appeared to get things straightened out fairly quickly and reviews later in the season were more positive. Subscribers were even offered a refund for the week 1 debacle. I didn’t subscribe last year for a couple reasons. First, I don’t own a PS3. I would consider picking one up up, but that leads to the second issue. I felt the $340 for the Sunday Ticket was just too high. I’d be looking at nearly $600 bucks for Sunday Ticket for the first year if you take into account the price of a new PS3. This year, I’m once again thinking about picking up a PS3 and subscribing. But will Sunday Ticket be available again this year on PS3? Or perhaps other internet connected devices? Currently, there is no mention of PS3 availability on the DirecTV website. Sunday Ticket is advertised on the Playstation Network site, but clicking the links merely loops you back to the home page with no additional information available for 2012. So, if NFL Sunday Ticket is going to be available via PS3 again this year, why wouldn’t DirecTV or Sony announce it by now? Wouldn’t they want to get the word out as soon as possible and begin a marketing campaign? If they are planning on offering the service on PS3 again in 2012, my guess would be that DirecTV wants to focus first on drawing as many subscribers as possible to their TV service. Only after they have maximized subscribers to the TV service will they offer it out to PS3 users. So, while it may seem less than encouraging that there is no word on NFL Sunday Ticket for PS3 yet in 2012, my guess (and it’s only a guess) is that we will get word somewhere near the end of August. Also of note is that DirecTV has dropped the price of Sunday Ticket this season to $200 for the standard package and are offering a NFL Sunday Ticket Max product for $300, which includes Red Zone and access via mobile devices. Hopefully these prices will also apply to the PS3. Or, at least not be any more expensive. A small part of my motivation to buy the Sunday Ticket through PS3 is my belief (Ok, hope) that, if the NFL sees heavy consumer demand to get these products on internet connected devices without being locked into a TV provider, it may convince them to dump the exclusivity deal with DirecTV and adopt a more consumer friendly model of universal access for all. I’m happy to pay the NFL a reasonable price for Sunday Ticket, I’m just not interested in locking myself into a TV provider just to get that one product. So, am I the only lunatic who might buy a PS3 just to watch football? Would anyone else pick up a PS3 just to get the NFL Sunday Ticket? If so, some budget friendly options could be to try to pick up a used one on eBay or Craigslist. I’ve also considered buying a PS3, and if the service doesn’t overwhelm me, I’ll simply sell it after the season. Thus, I’m essentially just renting the device for the duration of the NFL season. If you can pick up one used and flip it 6 or 7 months later the value probably won’t drop too much in that time. Unless, Sony comes out with a newer device. Hey, maybe we’ll get lucky and NFL Sunday Ticket will be offered on a variety of connected devices like the Roku and Apple TV. I’ve got to believe an awful lot of NFL fans would rush out and grab one of those devices to get NFL Sunday Ticket without the DirecTV commitment. For a look at what NFL Sunday Ticket was like on PS3 last year, check the video below.